Sure, you can go to your local Halloween store and pick up a cheaply-made $50 costume of a slutty nurse or Charlie Sheen, but where’s the fun in that when you can make your own costume for much cheaper? In the past few years I’ve thrown together witch and zombie costumes with clothing that I already had plus a few dollars for a witch hat or fake blood, but this year I’m back home and have an excellent seamstress at my disposal (AKA my mom). When I was a kid, my mom made me a homemade costume every year. From the hand-sewn gypsy ensemble I wore in 2nd grade to the epic werewolf transformation I made in 4th grade, complete with brown fur sprouting from my flannel attire, my costumes were always the best around. She even once sewed me a spider costume with three stuffed arms attached by string, so whenever I moved my arms, they moved with me. For this year’s Halloween shenanigans, my boyfriend and I decided to go as the Joker and Harley Quinn. While Joker costumes are fairly ubiquitous these days, Harley Quinn is not, so it was time to get a little creative. I bought two cheap dresses in the same style: one black and one red. The other things I bought out of convenience were black and red thigh highs to mix and match. Then my lovely seamstress took apart the dresses down the middle and sewed them back together Frankenstein-style. She also created black and red arm warmers and a hat based on a jester pattern she had. Instead of throwing a sheet over your head for a ghost, jazz it up a little: wear all white or gray and paint your face to match. Or take those white clothes and shred them up a bit, wrap some fabric around your head, and call yourself a mummy. Destroy your old prom dress with some fake blood to go as Carrie White (but please don’t use your telekinesis to set the party on fire). Get a black hooded cloak and a plastic scythe, and you’re the grim reaper (if you can’t get a scythe, then you can just be a dementor). Use a black sharpie to draw triangles and a mouth on an orange t-shirt, and find a green hat for a jack-o-lantern costume. If you still don’t have a costume yet, luckily you can make a simple one very quickly, but if you want a good one, then you better get on it! Halloween is less than a week away! And don’t forget to dress up your pets! So, what are you dressing up as for Halloween? Comment on this post (or any other post) to be entered into the Coffin Hop drawing. Check out the rest of the Coffin Hoppers here. Love the dog’s halloween outfit! Some great and easy ideas for Halloween costumes. The dog costume is to die for!! 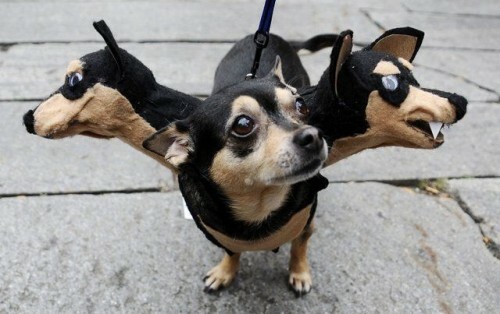 OMG, WHERE did you get that dog costume?? Do they make those for cats, too? I’ll be going as a witch – aren’t I the most original person ever!? Hey, I went as a witch for several years and I see nothing wrong with that. Being a witch gives me the excuse to dress wonderfully goth. I say, witch it up! Oh my god the DOG! Too good! New follower!